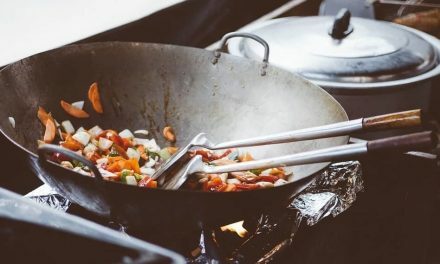 With the recent trend of glass top stoves on the rise, the demand for utensils and pots specifically made for these stoves has increased as well. These glass top stoves are perfect for any kitchen as they are easy to clean and maintain. The surface tends to be slick and flat. This, however, makes it incompatible with most traditional cookware. For the flat glass surface, it is quite obvious that only flat-bottomed pots and pans will be compatible. This is because the regular dome bottomed pots would not ensure even heat distribution. This is due to the fact that these glass stoves require contact and will only heat a surface it is in contact with. 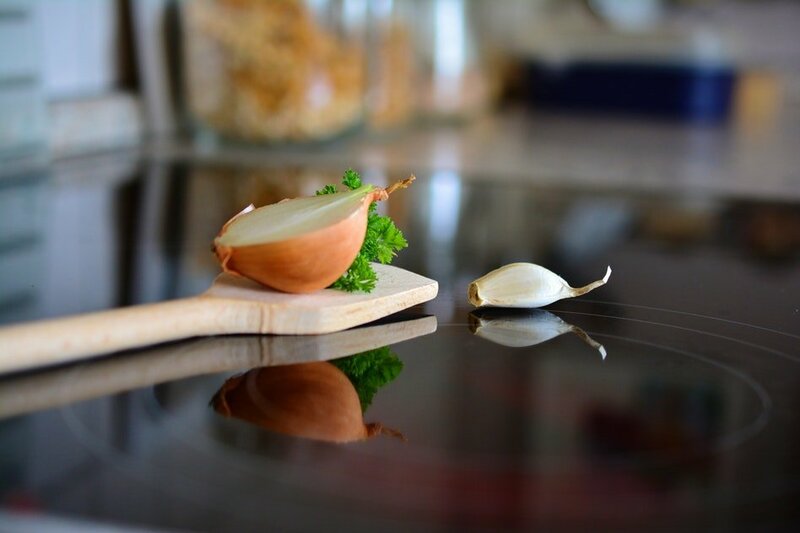 Since the surface is so smooth, you need a pan that has a heavy bottom to ensure that it does not shift around on the stove. Lucky for you, we have tested out some of the best cookware sets on the market and handpicked our favorites. The T-fal Cookware set has a multi-layered base which makes it safe to use on glass. The high-quality heavy copper flat base ensures that the glass is not scratched and it stays in place on the stove. The cookware contains 13 pieces in total with an 8 and 10.5 inches frying pan as well as a 12” covered fry pan. Also included are saucepans with volumes of one Steamer, and one, two and three quarts with a five-quart covered stew pot. The wide variety of pans and pots means you can take care of all your cooking needs with just this one set. The pots are made of stainless steel which provides much-needed durability to the structure. This ensures the pots and pans will last longer than usual and will be resistant to any corrosion or pits. The bottom of the pan, however, is made from copper. This ensures proper heat distribution for better cooking. So, with this set, you can get the durability of stainless steel with the heat distribution properties of the copper, all in one set. The stainless steel gives this set a stylish and modern look. The handles and the lids tie the whole look together into a modern affair. Also included are stylish stainless steel handles which are ergonomic in design. This ensures you can lift the pans and the pots comfortably without any strain. The glass lids for the components have holes in them which ensure no over boiling occurs. Moreover, the set is oven safe. In fact, it can stand temperatures up to 500 degrees F. This set is dishwasher safe as well, which makes it pretty easy to clean. This induction compatible set is perfect for everyday cooking! The set is dishwasher safe which makes it easy to clean and maintain. Copper base ensures even heat distribution to cook your food properly. Set contains all pots and pans needed for daily cooking. The heavy flat base makes it safe to use on glass stovetops. Ergonomic handles and glass lids for keeping an eye on your food. The T-Fal 13 piece cookware set is without a doubt one of the best cookware sets for induction hobs. The flat and heavy base ensures it doesn’t shift a lot during cooking. These pans work well on all induction tops as they have a copper base. Plus, they will last well. Whether frying a fish or simmering a sauce, this 13 piece set will do a great job. The Green Life 16 piece set is a non-stick cookware set that is perfect for everyday cooking. They are flat at the bottom and so can be placed for even heat distribution on the hob. Right off the bat, the first thing you notice is the beautiful lavender color which will make it a great addition to any modern kitchen. The cookware is actually made out of Thermolon Ceramic covered by a non-stick coating. Ceramic is usually very affordable which is why this set is cheaper than any regular metallic one. On the other hand, the non-stick coating makes it easier to slide food right out of the pan even if no oil is used. You might think that like all non-stick coatings, this might be loaded with toxic chemicals. However, that’s not the case! 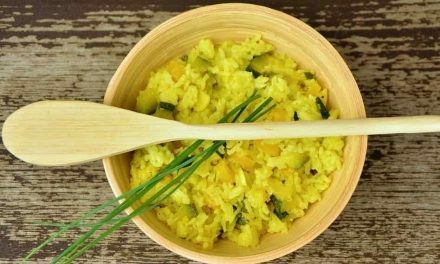 The GreenLife pans are manufactured free of any lead, cadmium, PFAS, and PFOA. So, you can heat the pans up and cook food as much as you want without worrying about toxic fumes. 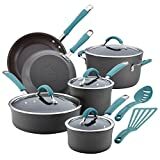 This 16 piece set actually includes a 4-inch mini frypan, a 7-inch and a 9.5-inch open frypan, a 1 and a 2 quarts covered saucepan, a 5 quarts covered stockpot, a 2.5 quarts covered saute pan and a steamer. Also included in this set are 4 multi-purpose black nylon kitchen utensils. The sturdy aluminum reinforced body is the perfect heat conductor to allow for more efficient cooking. It ensures the use of less energy while cooking all your favorite recipes. Also included in the package is the oven-safe Ergonomic soft grip handle which ensures maximum comfort. The handles stay cool and are oven safe to 350 degrees F.
What’s more is that the GreenLife Set is dishwasher safe as well as easy to clean by hand. See also: GreenLife Cookware Reviews. The non-stick coating makes cooking easier. Manufactured free of toxic substances. Soft-grip, stay cool, ergonomic handles. Sturdy aluminum body for better heat conduction. A wide variety of pots and pans for all kinds of cooking. 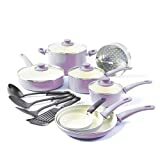 Dishwasher and oven safe for about 350 F.
All in all, the GreenLife 16 Piece Lavender Cookware set is a great choice due to the flat base and the aluminum body which makes for better conduction of heat. With a good selection of pots, pans and the utensils you are purchasing a complete set. It will sit snugly on the glass stoves and the ceramic body will ensure that it does not scratch the glass. The Cuisinart is a renowned company for manufacturing many high-quality kitchen utensils and appliances. Their 12 piece cookware set is no exception. This set is perfect for use on a glass stove as it has a flat bottom and a heavy base which will prevent the pots and pans from shifting around. This stainless steel cookware set is polished to perfection. The handsomely brushed exterior makes it perfectly suited to most modern kitchens. On the other hand, the mirror-like interior is non-reactive and does not discolor or react with food or other substances. The triple ply construction actually has a stainless steel outer shell with an aluminum core in between. This means better heat conductivity than a pure aluminum pot. The stainless steel also makes the pots and pans heavily durable so they will last a long time. The pots offer great heat retention and ensure even heat distribution by eliminating all kinds of hot spots. This 12 piece cookware set includes a 1.5 and a 3-quart saucepan, 8 and 10 inches open skillets, 3.5 quarts covered saute pan, 8 quarts covered stockpot and a steamer insert with a lid. All the pots and pans are oven safe up to 550 degrees F which means you can use them however you want. What’s more, the sides are tapered for easier pouring. Say goodbye to drips with these pots and pans! This cookware set is also dishwasher safe which makes cleaning and maintaining the set very easy. The tight-fitting stainless steel covers help seal in the food’s juices and nutrients for better results. These covers are dishwasher safe as well. The Cool grip handles allow you to hold the pan when it is hot without burning. Triple clad technology for even heat distribution and durability which makes it perfect for glass stoves. Dishwasher and oven safe up to 550 F.
Tight fitting lids ensure no nutrients escape the pan. Heavy base to prevent shifting around on glass stove top. The Cuisinart 12 Piece Stainless Steel Cookware set is a great choice due to the Multi-clad technology which grants it better heat distribution and conduction than regular aluminum pans. The base of the set is heavy and flat which means you won’t find it shifting around on the stove top too often. Other features such as being dishwasher safe and oven safe are an added bonus. 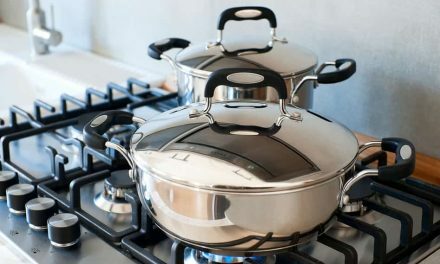 As we already mentioned, aluminum cookware is the go-to cookware for glass top stoves. This is because of the even heat distribution and superior conduction this material offers. So, it should come as no surprise that the Rachel Ray Cucina 12 Piece Non-Cookware Set is in our list. This cookware set has a hard anodized aluminum construction which makes it a better conductor than just regular aluminum by ensuring even and better heat distribution. The set also features a non-stick coating which allows for easier cleanup. The coating is free from all kinds of toxins such as PFOA so your food can remain safe. The pans and pots are colorful and contemporary in style. The matte gray body when paired with the blue agave handles makes this set a winner in the looks department. The handles are made from a silicone coating over stainless steel to allow for a more comfortable and cool grip. The modernly styled glass lids tie the whole look together. The glass lids are shatter-resistant and have wide stainless steel rims which ensure a tight fit. 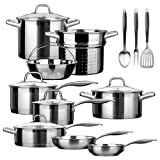 This 12 piece set has a wide variety of cooking pots and pans as well as utensils. These include a 1 quart and a 3 quart covered saucepan, a 6 quart covered stockpot, an 8.5-inch skillet, a 10-inch skillet, a 3 quart covered Sautee Pan, a nylon slotted turner and a spoon. 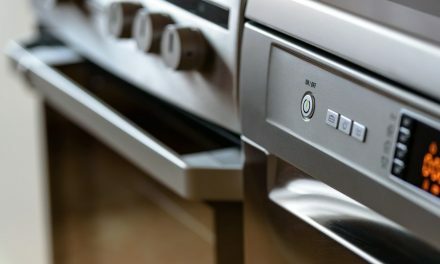 Furthermore, the utensils and pots and pans are oven safe up to about 400 degrees F. Although, these are suited for all types of stovetops, they are best to be suited to glass top stoves. They are dishwasher safe so you can pop them right in the dishwasher without any worries. Also included is a limited lifetime warranty which means you can return or exchange the cookware set in case of any manufacturing defects. This ensures that your investment is safe and sound. Anodized aluminum construction for better heat distribution and conduction. Best used with glass stovetops. Contains nylon utensils as well as various pots and pans. Dishwasher and oven safe to about 400 deg F.
Non-stick coating free of all toxins. Shatter-resistant glass lids with soft handles. The Rachel Ray Cucina Hard-Anodized 12-piece cookware is perfectly suitable for cooking all kinds of recipes as it comes with a wide variety of pots, pans and utensils. The non-stick coating is toxin free so you can rest assured your food will not be contaminated. The 12 piece set is perfect for use on glass stoves due to the anodized aluminum construction and its flat bases. If you’re looking for a professional grade cookware set, then perhaps the Duxtop 17 piece set is your best choice. This stainless steel induction cookware is specifically designed in such a way to ensure it fits perfectly on the stove. The flat yet heavy bottoms rest firmly in place and ensure that the glass does not get damaged while in use. The set includes a diverse set of cookware utensils including a steam basket as well as a 9.5-inch pasta basket, a 8 and 9.5-inch frying pan, a 1.6 Quart and 2.5-quart saucepan with lids, an 8.6-quart stock pot with lid, a 5.5 Quart Sautee pan with a helper and lid, and a 4.2 quart casserole with lid. However, that’s not all. The set comes with 3 utensils including a slotted turner, a 2-pronged fork and a spoon. The set is constructed from commercial grade (18/10) stainless steel, which ensures the durability and longevity of the pots. The bottom is made of a hefty gauge aluminum, which grants it better heat conductivity and distribution. The heavy-gauge bottom prevents the pots or pans from shifting around. Also included are ergonomically shaped handles with an anti-slip satin finish. This makes it comfortable for you to hold on to the pots and the pans without burning and reduces slippage. The handle is firmly riveted to the pans which ensures it doesn’t wobble or break. This cookware set is perfect to be used on all types of stoves, be it electric, gas, induction or ceramic. The set is not only oven safe to about 550 deg F, but it is also freezer safe which makes food storage that much easier. To help you clean the set easily, all components are dishwasher safe as well. What’s more, is that the set comes with a limited lifetime warranty to ensure your investment is sound. Heavy gauge aluminum bottom which makes it perfect for glass stoves. Stainless steel construction ensures longevity and durability. Ergonomic, anti-slip handles make it easier to grip. Dishwasher, oven, and freezer safe. Wide variety of utensils, pots and pans. This Duxtop 17 Piece is a professional grade cookware set perfect for use on all types of stovetop. The heavy grade aluminum bottom ensures the pots never slide around on the stove while the stainless steel construction ensures the durability and longevity of the set. From ergonomics to the safety features, the Duxtop ticks all the right boxes. This is a great set offering a wide variety of pots, pans and utensils included as part of the set. All in all, any one of our top picks will be great due to their high-quality materials, aluminum or stainless steel. If we had to choose one we would probably choose the T-fal ultimate Stainless Steel 13 pieces Cookware set. This is due to the base being such a good conductor of heat. The copper base ensures an even distribution of heat and reduces all kinds of hot spots.